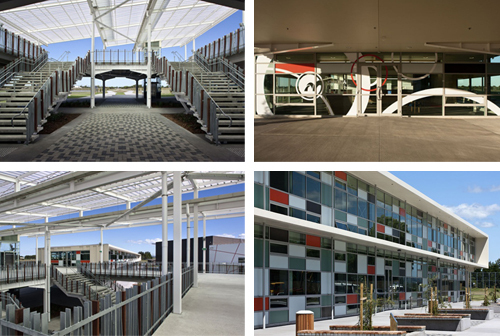 ASC Architects were tasked by the Ministry of Education with creating a new Green Star-rated secondary school - the building was completed a year ago in 2011. "We approached it with the idea that schools should be about more than students - they should become part of the community fabric", says John Sofo, the lead architect. The school took a brave approach and decided to embrace a new type of 'project-based learning': "So the challenge for us was defining what sort of teaching environment would allow that to occur..." - Sofo. The layout of the building is in an x formation - allowing for plently of natural light and ventilation to flood each of the spaces. The building also teaches the students about sustainability - with calculations for earthquake proofing and load bearing drawn onto the buildings' walls - teaching the students about the physics behind the building. Rainwater harvested is measured and can be accessed by the students on the school's intranet; whilst gardens allow for students to grow their own edible plants. Instead of traditional classrooms, spaces are arranged loosely as long communal spaces holding about 100 students. Similar to the 1970s "schools without walls" model - enabling for more collaborative learning. These spaces break out into various facilities - break-out rooms, meeting spots, a variety of table and desk forms for different tasks. Via InDesign Live and Architecture Now. Architecture and designs are adorably great and fantastic.